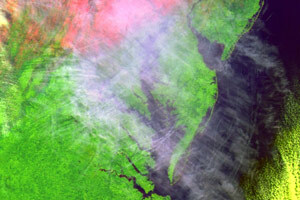 The false-color image above shows jet contrails in the skies above the mid-Atlantic coast on 1/26/2001. Check out this photo taken on the ground at about the same time. When U.S. commercial air traffic was grounded following the 9/11 attacks, atmospheric scientists took advantage of this opportunity to investigate the effect of jet contrails on Earth's climate. The results showed that contrails produced cooler days--more sunlight was reflected from the contrails--and warmer nights--more heat radiated from Earth was trapped (this trapping is the greenhouse effect).